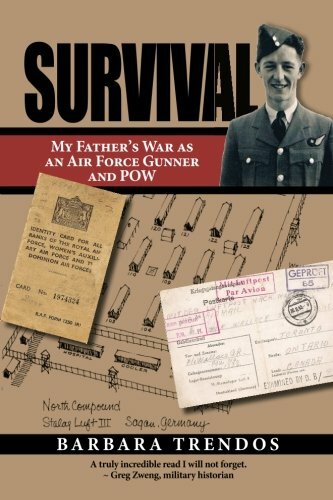 Barbara Trendos weaves a compelling story of a young man’s service as a Canadian Air Gunner and later, as a POW in Stalag Luft III (site of The Great Escape). To accomplish this, she draws on the kriegsgefangenenpost and postkartes her father wrote home from the prison camp; the official war correspondence, telegrams and prison camp photos lovingly saved by her grandmother; interviews with her father; and on her own considerable skills as a creative non-fiction writer. BARBARA TRENDOS was born and raised in Toronto. Although a lover of writing from early on, she pursued a business degree that led her to a long and varied career in the financial services industry. But as water finds its own level, Barbara ultimately ended up in corporate communications. Barbara lives in Markham with her husband George. The seeds of inspiration to write this book were first planted in Barbara in the 1980s when her father, Albert Wallace, casually shared the contents of an old file folder he had discovered amongst his mother’s belongings after she passed away. It was a treasure trove dating back to World War II: fragile letters that Albert, her only son, had written home while he was a prisoner of war in Hitler’s Germany; official Air Force telegrams and correspondence that variously reported Albert as MISSING, then as a POW, and finally LIBERATED; dog-eared black and white snapshots that begged identification of people, time and place. Barbara was hooked, and realizing that she knew only the highlights of Albert’s wartime story, naively undertook to fill in the gaps, to what end even she didn’t know. Her research into World War II, 419 squadron and the RCAF, the British Commonwealth Air Training Plan, Stalag Luft III, prisoners of war and The Great Escape took on a life of its own. Years later, this book was born.